Stylishly geeky rocks glasses printed with script from two of America's most historical documents. Sip in Founding Fathers style with one of these elegantly geeky rocks glasses. 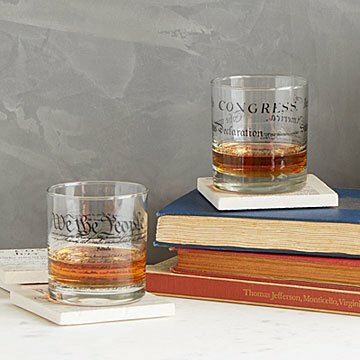 Printed with script from either the US Constitution or Declaration of Independence, they pay tribute to the foundation of American government... and a stiff drink. Give one to a beloved history buff, teacher, or champion of the American Dream. Made in Virginville, Pennsylvania. Make it a collection with the Democracy Coasters - Set of 4. I got this as a gift for a friend who recently received her US citizenship. She absolutely loved it. My husband liked it too so I'm getting another one. My husband didn't get a chance to use it. The glass broke while taking it out of the gift box. Good quality, but plan to hand wash. Very nice glass would recommend to anyone looking. It is worth the money. Perfect gift for a friend in law school. These glasses are perfect for anyone looking for a unique conversation starter, never to be returned gift. You cannot hand someone a drink in these glasses and NOT spark a discussion. Perfect.